Yesterday we saw the first photos of Audi's new hot hatch hotness, the 2015 Audi S1. Now we have some specs to go with it, and it sounds like the new S1 will be pretty quick for such a small car. 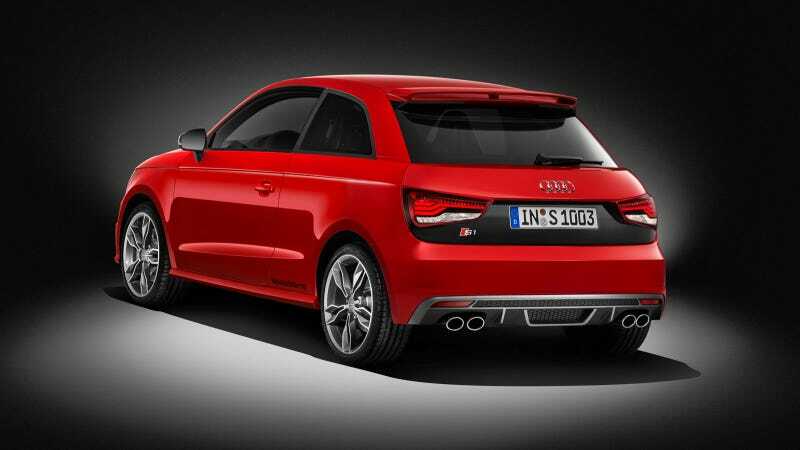 Audi today said the S1's 2.0-liter TFSI motor puts out 231 horsepower and a very healthy 273 pound-feet of torque. That should make it move from zero to 60 mph in about 5.8 seconds and keep on going all the way up to a top speed of 155 mph. Quattro all-wheel drive and a six-speed manual are standard. Not bad at all, right? Also, the photos of the yellow car we got yesterday were of the S1 Sportback. We now know there will be a three-door version as well simply called the S1. That's good! Who needs practicality when you can have style, right? Audi says the S1 twins will go on sale in Germany later this year and will start around 29,950 Euro, which is about $40,000 in America-money. Of course, we won't have to worry about that price conversion because it's almost certainly never coming to the U.S. Sad face!